With its undulating plan, this residential tower is one of the most distinctive in the city. Erected by The Related Companies, one of the developers of the Time-Warner Center at Columbus Circle, it was designed by Gwathmey Siegel & Associates, which designed the expansion of the Solomon R. Guggenheim Museum on Fifth Avenue and the 52-story Morgan Stanley Dean Witter and Co. Building that was completed in 1990 on Times Square. Gwathmey Siegel & Associates came to fame as one of the "New York Five" group of architects who in the 1960's focused on the white, modernist style associated with Le Corbusier. With its sinuous curves, this tower is New York's answer to Chicago's famous Lake Point Tower designed by Shipporeit & Associates, a reflective glass structure whose curves wrap around a three-point plan that is one of the landmarks of modern architecture. This tower is much smaller than the Chicago building, which is also more prominently sited on Chicago's lakefront. 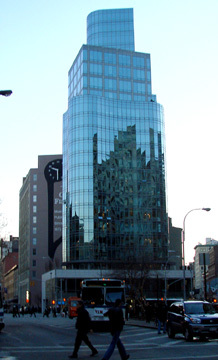 This tower, however, does have considerable visibility as it is at the northern terminus of Lafayette Street at East Eighth Street and directly across Fourth Avenue from the landmark Cooper Union Building where East Eighth Street becomes St. Mark's Place, the gateway to the East Village. A free-standing tower, this tower is actually a more complex form than Lake Point Tower because the undulating façade is wrapped around a rectilinear core, with a different façade treatment, that rises on the southernmost bay of the tower's east façade and extends above at the tower's first set back on the north and west facades. The curved façade extends upwards two more floors on the north east facades and the top flour floors above the rectilinear portion continue the curve facades on all but the north facades. The residential tower is set back on a two-story commercial base that conforms to the traditional straight building lines of the property. Charles Gwathmey, the architect, has referred to this project as "Sculpture for Living" and observed that it "has no front and no back" and is "a rotational object." The 21-story, 270-foot-high building has 39 apartments that initially were priced at about $1,995,000 for 1,449-square-foot, two-bedroom units to $8,750,000 for the largest of the four full-floor penthouses of more than 3,747 square feet plus a 328-square-foot terrace. 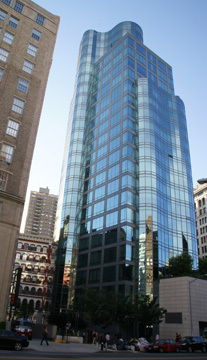 The curved glass facades have blue-tinted, floor-to-ceiling windows. 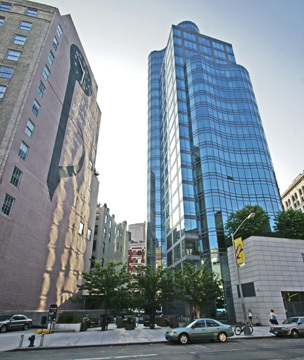 In an August 11, 2004 article in The New York Post, Lois Weiss reported that "Related had proposed the triangular Astor Place site become an Ian Schrager Hotel designed by Rem Koolhaas to look like a piece of Swiss Cheese. Lucky for all, that deal was never consummated with Cooper Union, the owners of the lot....Instead, Cooper Union eventually agreed to a prepaid 99-year lease with Related which is creating co-op apartments with condominium rules." Had the tower been completely wrapped in the blue-glass curved faces and not had its two-story rectilinear base, it would have been a very stunning minimalist sculpture. As it has been designed, it is still stunning but with a degree of arbitrariness that is a little disappointing. Nonetheless, it is a most welcome new landmark at a very important intersection surrounded by such important architecture as Cooper Union, the New York Public Theater and Colonnade Row, the latter two on Lafayette Street. It has also been the harbinger of several important new architectural additions to the neighborhood. Cooper Union has commissioned Morphosis to design an academic building on the Bowery across McSorley's at 7th Street and it also has entered into an agreement with Edward Minskoff for a new office building designed by Fumihiko Maki to replace its engineering building across Cooper Square from its historic main building. There are also several new towers further south on the Bowery. Greenwich Village has its Jefferson Market Library tower and now the East Village has this pinnacle. In the May 2, 2005 edition of The New Yorker Magazine, Paul Goldberger wrote a rather scathing review of this project, describing it as "elf prancing among men," adding that "it doesn't belong in the neighborhood...on one of the most prominent sites in lower Manhattan." "This young intruder," he continued, "hasn't much to say to its neighbors," adding that "Its shape is fussy, and the glass facade is garishly reflective: Mies van der Rohe as filtered through Donald Trump. Instead of adding a lyrical counterpoint to Astor Place, the tower disrupts the neighborhood's rhythm." Mr. Goldberger overlooked the Cooper Union building just to the north of Cooper Union, one of the ugliest buildings in the city, and while he may not like "garishly reflective" glass facades a case could be made for them being "lyrical counterpoint." "By designing a tower with such a self-conscious shimmer, the architect," Mr. Goldberger continued, "has destroyed the illusion that this neighborhood, which underwent gentrification long ago, is now anything other than a place for the rich." Mr. Goldberger conveniently neglected to mention that Cooper Union itself is building a very modern building one block to the south and that the Related tower was only one of several major new tall buildings radically changing the East Village and Lower East Side landscape. 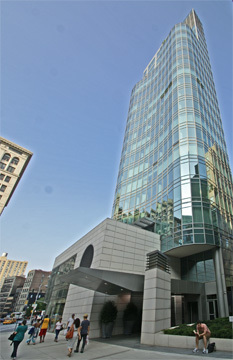 Other prominent new towers include "Blue" at 105 Norfolk Street" and The Hotel on Rivington. 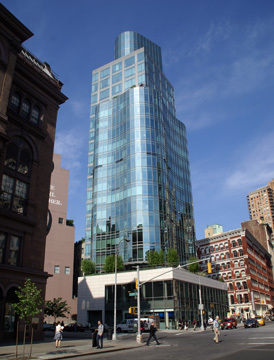 Mr. Goldberger does note that some "exceptionally elegant glass towers designed by Richard Meier that went up on the western reaches of Greenwich Village a few years ago changed the rules." Meier's buildings are pleasant but not earth-shattering. Gwathmey's tower, on the other hand, is not pleasant, but awesome, especially by New York City standards. It is rather ungainly and it does invoke suburban office park aesthetics but it is chunky and powerful and sinuous and bright and sparkling and, most importantly, reasonably tall. It is an important new landmark. It is not the Eiffel Tower but it is modern and that is actually fairly rare in New York. The rectilinear base and the boxy section near the top are unfortunate. The free-standing building should have been all curves, even if that would make it a poor clone of Lake Point Towers. Apartments range in size from 1,449 to 4,156 square feet. The building's promotional materials proclaim that it is "Manhattan's first rotational, asymmetrical, sculptural building that can be viewed three dimensionally." Gwathmey Siegel and Associates also did the interiors along with Ismael Leyva Architects. Ceiling heights range from 9-feet-six-inches to 11 feet and all apartments have two or three exposures and individually controlled heating and air-conditioning. Each apartment has a washer and dryer. Kitchens have Sub-Zero refrigerators, Wolff stainless steel cooktops and ovens, Miele dishwashers, "Jet Mist" honed granite countertops and solid cherry wood cabinets, and Viking wine coolers. Bathrooms have six-foot soaking tubs by Kohler, two vanities with sink carved of solid Absolute Black granite in a honed finished, recessed medicine cabinets by Robern and Statuary white marble flooring and tub enclosure. The building has a 25-foot-high lobby and the penthouses have keyed elevator access, terraces and fireplaces. There is considerable traffic at this location and excellent public transportation with numerous subway and bus lines within two blocks. 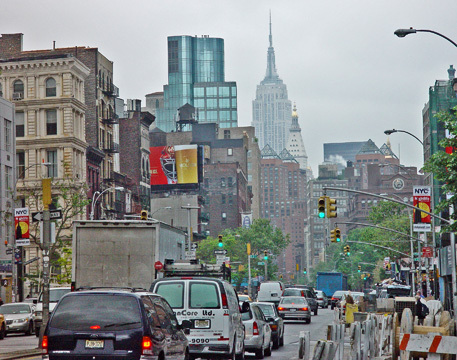 The area abounds in students from both Cooper Union and nearby New York University and there are many, restaurants and boutiques nearby. The city's greatest saloon, McSorley's, famed for its beer and crackers and cheese with horseradish mustard, is one block away. The location here is convenient not only to the East Village and Greenwich Village, but also the great Strand bookstore four blocks to the north, Union Square and NoHo.